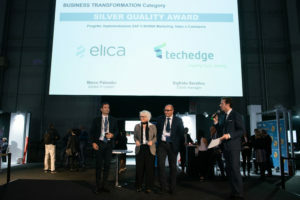 Elica is Silver Winner at SAP Quality Awards (conferred to companies that stand out for their best practices in the IT sector) in the Business Transformation category. Elica has started an important digital transformation project to optimize the main processes in the sales and marketing area, introducing procedures considered by SAP as “best practice” to support the processes of this area in a stable and scalable manner. As communicated in a official note, thanks to the innovative SAP C/4HANA suite adopted by the company, Elica can revolutionize the user experience along the entire customer journey, creating customized contents, realized ad hoc on individual needs. “Today the relationship with consumers can not be separated from a precise analysis of their purchasing behavior, in order to offer not only the best experience during the sale but especially in the next phase of customer assistance – commented Gianluca D’Arcangelo, Chief Information Officer of Elica -. Our company is very care to the evolution of the market and focuses on innovation at 360°: this is why we have implemented front end and back end solutions to offer a unique, real-time view of the consumer to all company divisions, from sales assistance and commerce, up to accounting systems and supply chains. These data, analyzed and processed, allow us to plan targeted activities that can further improve the consumer experience”.